Hello! I made this for today's CAS Challenge on SCS which was an inspiration challenge. We were to use inspiration from shoes or bags on the Anthropologie website. I chose this adorable bag here because I liked the colors and layers. 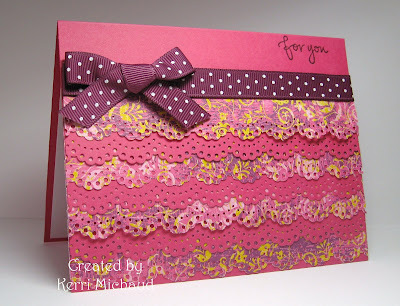 I used Melon Mambo for the base of my card, and cut stips of SU Razzleberry Lemonade dp and Melon Mambo. I added scallops with a Martha Stewart Punch, and layered the strips on the card. I added the Rich Razzleberry ribbon and bow, and the sentiment from SU Great Friend and it was complete! Very CAS! I took this picture last night for her first school project which was to decorate a paper doll to look like her. Pictures of the kiddies - love it!! Your little girl looks nice and tan like she's been having some beach time this summer. Your little boy is so cute with his little smile...adorable! That card is so neat - - it doesn't look simple....but I guess in how you put it together it really is - - love the colors too. Your card is gorgeous. And totally perfect for the inspiration piece you used. Your kiddos are darling! I hope the first day is a smooth one. Kerri I LOVE all those scallops how beautiful, great colors!!! My kids went back to school today too, hope your kids had a blast on the first day!!! Hugs! What a fabujous idea for the card...I love it!